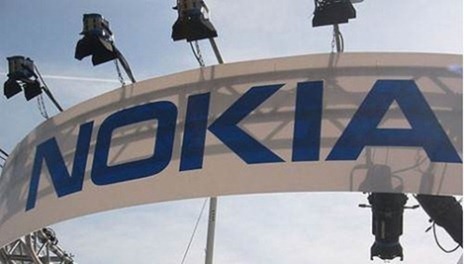 After years of leading the mobile handset market, in both hardware and software, Nokia is now slipping down at a alarming pace. 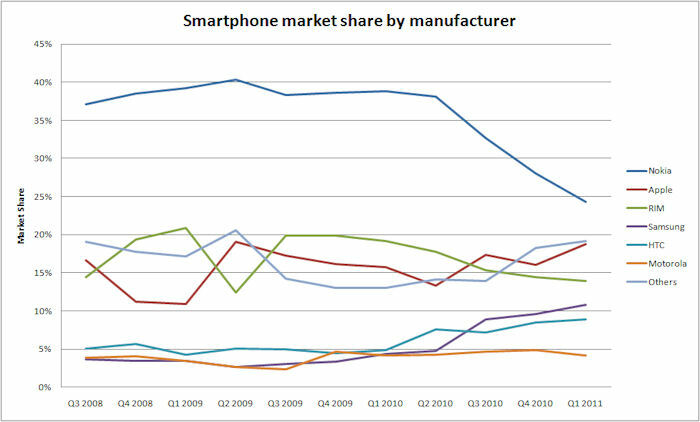 With every passing quarter, companies like Apple, Samsung & HTC are increasingly grabbing up the Nokia’s market share. 1 Smartphones are replacing feature phones! 2 Over-estimating own OS development capabilities? 3 Winds of Change…Partnership with Microsoft! Smartphones are replacing feature phones! Once considered products for only geeks & elites, Smartphones are now having a high adoption rate. For the first time in US market sales, Smartphones have overtaken traditional mobile phones by securing 55% share in Q2 (2011). 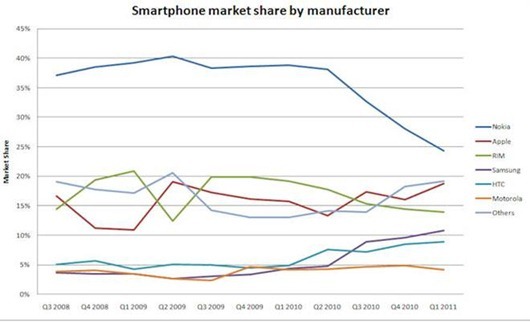 Its the change of this market nature, which has hurt Nokia the most. One of the prime reasons why Nokia is lagging behind in Smartphone race is because Smartphone is not a traditional device. Its effectively a computer that makes calls. Hence it is natural to be at disadvantage against companies that have been traditional developers of OS for computers. Over-estimating own OS development capabilities? One can accuse Nokia of over estimating its own software capabilities to make competitive OS for Smartphones, hence its resistance to form partnerships with other companies. Nokia was caught off-guard when Apple launched iOS, which was fairly superior operating system compared to Nokia’s Symbian. The fact that Symbian was never designed primarily for touch-screen capabilities contributed to this superiority. Nokia also had another chance to compete by rolling out few phones powered by the only close competitor to iOS i.e. Android, but Nokia simply rejected the offers. “adopting Android is like Finnish boys peeing in their pants for warmth; the relief is only temporary”. Instead, Nokia (in partnership with Intel) invested hugely in development of open-source linux based operating system, Meego. But as the work on Meego progressed, it became increasingly clear that Meego neither has enough sophistication nor developer interest to become a plausible threat to iOS or Android. Winds of Change…Partnership with Microsoft! 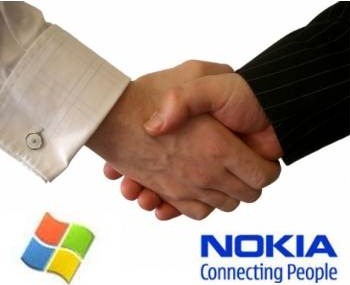 On 11th Feb 2011, Nokia gave up its Meego plans, and declared its partnership with PC OS giants, Microsoft. Microsoft would be coming with ‘Mango’ upgrade for Windows Phone 7 that would power new Nokia smartphones. Initial previews of Mango OS look promising and aesthetically appealing. This partnership is a partnership of equals considering that Nokia & Microsoft are both huge companies in their respective domains and both of them have been left out of Smartphone party. But building just a superior OS shipped on a superior hardware will be a necessary but not sufficient condition for success. A lot will also depend on how Microsoft & Nokia are able to lure developers to create exciting apps for WP7 platform. So lets keep fingers crossed and see whether the old giants will be a staging a comeback? Or would they further slip down? Looking forward to know what our readers say about this. Who provides the Best 3G services in India? I think…old giants will be a staging a comeback.